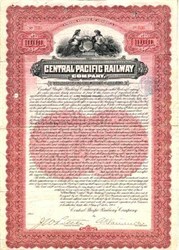 Beautifully engraved certificate from the Central Pacific Railway issued in 1904. 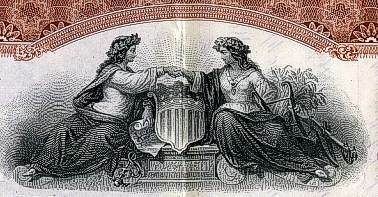 This historic document was printed by the American Banknote Company and has an ornate border around it with a vignette of two women shaking hands symbolizing the connecting of Union Pacific Rail Road and Central Pacific Railway Chartered by act of Congress in 1862 at Promontory, Utah. This item has the hand signatures of the Company�s officers and is over 100 years old. This scarce bond has been folded and shows some signs of wear. The Central Pacific was chartered by Congress to construct a portion of the first transcontinental line, starting in Sacramento and proceeding eastward. Much of the construction work, especially the dangerous assignments, was accomplished by Chinese immigrants. The line crossed the Sierra Nevada mountains into Nevada, followed the Humboldt River and linked with the competing Union Pacific Railroad near Ogden, Utah on May 10, 1869. The Central Pacific was the project of two of the great railroad barons of the day, Leland Stanford and Collis P. Huntington. While the Central Pacific lost out in the race to construct the most mileage, it was an immediate financial success; lands received in government grants were sold to ready buyers, which provided sufficient income to cover construction costs.